Bianca Dyer with her award from the Gulf Coast Undergraduate Research Symposium. She prepared for the symposium with help from Astrid Mueller, her current mentor at the University of Rochester, and John Kuhn, who runs the University of South Florida lab where she did her REU last summer, not far from her home in Tampa. “This was a really great opportunity to represent a university where I come from and where I am now. Everyone was really supportive." Bianca Dyer ’20 got her first experience in a research lab last summer. The chemical engineering major from Tampa, Fla., definitely made the most of it. She became well versed in the use of zinc gallium oxynitride as a potential photocatalyst for converting carbon dioxide into fuel. 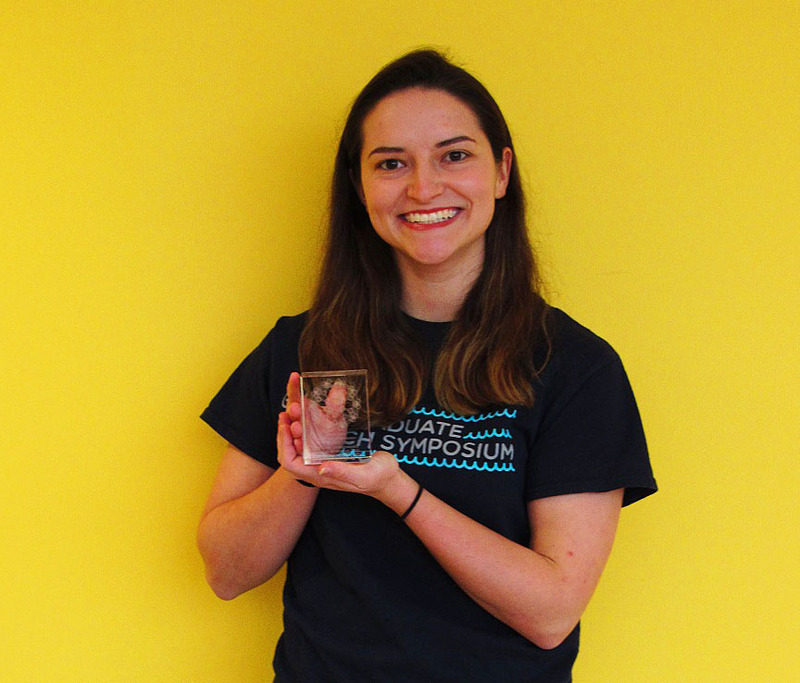 Dyer then parlayed her newly gained expertise into an award for Outstanding Presentation in Energy at the Gulf Coast Undergraduate Research Symposium at Rice University. The following month she finished second-place overall in an Engineering Science Symposium at the Society of Hispanic Professional Engineers National Conference. And now she knows exactly where she’s headed -- both long- and short-term. Dyer did her research last summer by participating in a REU (research experience for undergraduates) program at the University of South Florida, near her home in Tampa. “I just started looking up engineering internships on the internet,” she says. She worked in the lab of John Kuhn, associate professor of chemical and biomedical engineering. “We want to convert carbon dioxide into things that are more useful, because CO2 is so harmful for the environment,” Dyer explains, when asked to describe her project. One potential catalyst to do that is zinc gallium oxynitride (GaN:ZnO). But so far it has only worked with ultraviolet light. 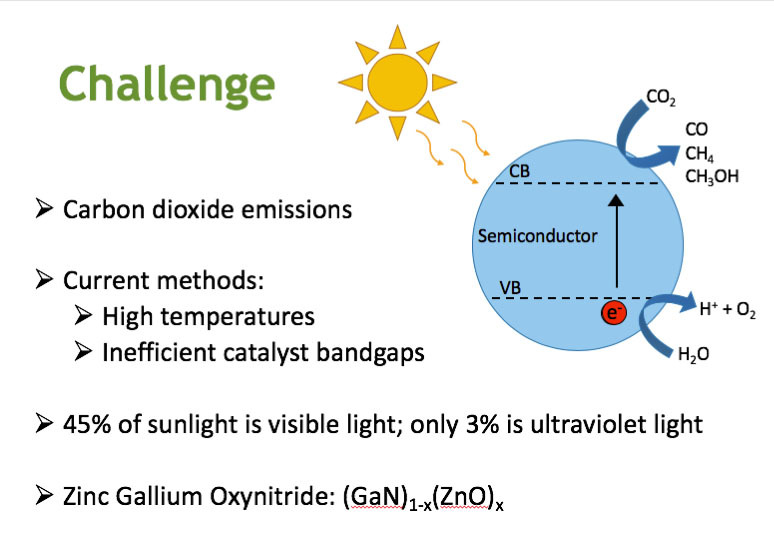 A key part of Dyer’s project was to synthesize GaN:ZnO with different ratios of zinc and gallium, and then obtain data to help characterize the photocatalytic potential of each combination. She especially liked her work schedule. Dyer became interested in science early on. “Everybody wants to be a doctor at first,” she says. She took biology, chemistry, and physics in high school – and discovered she liked chemistry the best. Chemical engineering, her teachers suggested, would offer multiple career paths. So, Dyer decided to come to the University of Rochester. It not only offered a strong engineering program, she says, but the opportunity to experience a northern climate and to play varsity volleyball and tennis. She does not regret her decision. “I’m doing well. I’m into it,” she says. She’s been a teaching assistant for six different classes. She’s mentored first year students in her residence hall. And she’s still playing varsity tennis. But does that leave any time for fun?